Travel to El Emir beach near Punta del Este if you want a chance to enjoy a coastal region that lets you live life to the fullest. There are some outstanding beaches that you can discover on this peninsular setting, but at El Emir beach you have the opportunity to catch the adrenaline rush as you experience the powerful strength of the Atlantic surf. There are a number of tourists and people of Uruguay who come to explore the picturesque quality of this coastal area, but usually it will be the serious athletes who tackle the water and waves at Playa El Emir. Of course, the surfing in Uruguay also helps attract spectators to this Uruguay beach. One of the best features about this Punta del Este beach is that it is located so close to many other popular tourist attractions. Portezuelo, Laguna del Sauce, Jose Ignacio, and Solanas are other coastal settings that are only a short drive away. You can enjoy visiting Playa Mansa where swimming, fishing, hiking and sunbathing remain favourite Uruguay activities that can be enjoyed throughout most of the year. You can wander out on the bridge that extends over the beach so that you can view the picturesque scenery that surrounds this region. While you are here you will probably see a number of people casting lines hoping to snag some of the local kingfish. You can also revel in the spectacular views that you have of such sights as Gorriti Peninsula and neighbouring Islands. Visitors are amazed by the number of activities that are available to them when they visit this Uruguay beach. 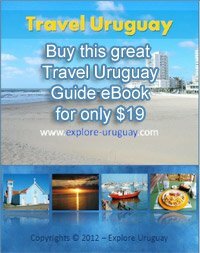 From this Punta del Este location you can travel easily to many other areas of this popular peninsula. There are boat tours available here that will take you to Isla de Lobos which is found about 20 km off the coast. Lobos Island is famous for its sea lion population, and this colony is the largest collection of these ocean creatures in all of South America. You may also wish to tour the nearby Isla Gorriti which is home to two major tourist beaches, Playa Honda and Puerto Jardin. A holiday at El Emir Beach will afford you a chance to travel around the many neighborhoods, cities, parks and shops that are found in the Punta del Este district. You can spend the morning at the beach and your afternoons visiting historic locations or enjoying the fine restaurants, museums and casinos. The choice to create the vacation of your dreams is now in your hands.